"Kafkasya üniversiteler Birliği (KüNİB) (English: Caucasus University Association) is an association of universities founded in November 11, 2009. It gathers univesities from Azerbaijan, Georgia, Iran, Kazakhstan, Kyrgyzstan, Moldova, Northern Cyprus, Russia (including Chechnya, Daguestan) and and Turkey. 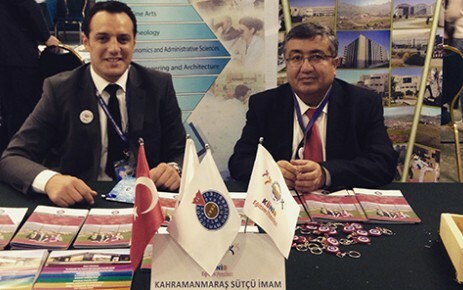 They organize the KüNİB egitim fuari (KUNIB education exhibition), which is a showcase of educational programs and benefits from all the members (more than 70 Universities), and has its own flag. The flag is the logo on a white horizontal background as seen here (third flag from left to right) and here (second flag from left to right).